Wildberry Lodge is truly the result of love for the area, passion for innkeeping and construction of what we consider the perfect luxuriously rustic buildings to become a beautiful and beloved vacation lodge in North Carolina’s Smoky Mountains. The inn consists of both the main building which contains four rooms and one suite, and “The Cabin at Wildberry” which houses two suites. While staying at the lodge, guests are welcome to make use of all common spaces, both indoor and outdoor. Our Forest Retreat features two decks with comfy seating and a stone fire pit with stone-slab benches. A short lighted pathway leads from the Lodge to the Fire Pit. Good conversation and s’mores await you! Our guests asked for hiking trails, and our first one is open! Hike from the Lodge to the ridge and return via a loop around one side of the property. We hope to have more open in the near future, so be sure to bring your hiking shoes! The Loft area is a gathering place for all guests. 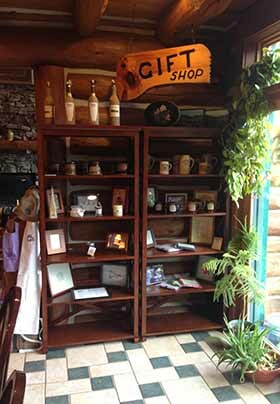 Here you’ll find cold drinks, snacks, satellite television, DVD, and CD players. The Loft overlooks the Great Room and has a view of the 3 story fireplace. The Game Room, an additional guest gathering place, has a beautiful handcrafted table top shuffleboard, a pool table, board games and TV for those rainy days, or unwinding at the end of the day. There is also an infrared sauna that soothes muscles after a day of hiking. 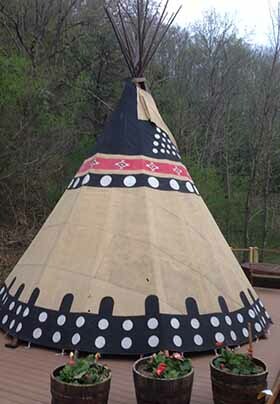 We now have a real Native American tipi fashioned in the Sioux Indian style. We are not sure the final use of the tipi – your ideas are welcome, stay tuned. The Spa deck has a sunken seven-person Jacuzzi Spa with double water fall and views of the mountains. Get ready to relax! Our environment is our life-blood and we would like to share our efforts to help preserve it. Water: We provide reusable (BPA-free) sports bottles instead of bottled water, and our 700-foot rock well has the best drinking water you can imagine – and it also makes the best coffee! Log construction: We wanted to take advantage of sustainable and energy-efficient building materials when constructing Wildberry Lodge. The main component of all our buildings is logs, a construction material which is fully renewable and recyclable, and has a lower carbon footprint than any other building material. In addition, the logs provide thermal mass. Thermal mass refers to the property of a material to store and delay the transfer of heat, and is what makes log homes exceptionally energy efficient.